"My favorite chicken salad of all times. This is one you must try if you are a fan of chicken salads. Use white wine Worcestershire, if you can find it. Try serving this salad on a bed of lettuce or as a sandwich filling." In a large, self-sealing bag, combine honey and Worcestershire sauce. Add chicken and place bag in a shallow dish in the refrigerator. Chill 2 to 4 hours, turning bag occasionally. Remove chicken and discard marinade. Grill chicken over medium heat for 12 to 15 minutes, until juices run clear and chicken is no longer pink inside. Remove from grill, cool and chop. In a medium bowl, whisk together the remaining honey, mustard, vinegar, lemon zest, lemon pepper, poppy seeds and garlic powder. 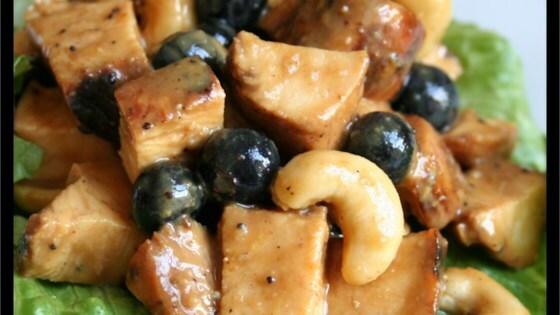 Add chicken, grapes and cashews and toss until evenly coated. Cover and chill until serving. Your stomach AND your soul will be happy after you enjoy a bowl of this! I did not like this at all. My co-workers did not like it either. Served this recipe at a baby shower. Everyone loved it ... it was quite a change from traditional mayonaise based chicken salad. Everyone appreciated the change! had 60 people and everybody loved it...delicious!! This is great! It's very different from traditional chicken salad, and is also very healthy for you! This taste great! I served it during a dinner for my friends and they loved it. I thought it was pretty good. I added celery which was good. To make it even more healthy I put in on a spinach tortilla along with shredded lettuce and rolled it into a wrap. This recipe was really yummy. Just a bit sweet so I added broccoli and lettuce and put it in a tortilla. Really good, thanks for the recipe.